Nice welcoming host - nice balcony and a very clean and well equipped apartment and a good parking space. Very hospitable and welcoming hosts. Good location quiet from any hustle bustle. Our hosts were very friendly. The villa was very nice, with enough shadow in the garden and a pleasant pool. The apartment was large and nicely furnished. Sehr nette und bemühte Gastgeber. Alles sehr sauber. Für Fragen jederzeit ein offenes Ohr. Sehr empfehlenswert!!! Gyönyörű kert, nagyon kedves háziak. Szép fekvés. Nagyon tágas tér és gyakorlatilag teljes felszereltség. A medence és az udvar nagyon szép, a Balaton az összes emeleti szobából látszik. A konyha felszerelés kiemelkedő. Lock in a great price for Landhaus Forrás – rated 9.1 by recent guests! One of our best sellers in Balatonfüred! With a free outdoor pool, Landhaus Forrás is located on a hillside, 1.6 mi from Lake Balaton. The center of Balatonfüred is just 500 feet away, and Balatonfüred Ferry Port is 1.9 mi away. Free WIFi is provided. Barbecue facilities can be used in the small well maintained garden with a furnished terrace. Laundry facilities for self usage are also at guests' disposal. Massages and pedicure are available upon a prior request and at a surcharge. Amenities at the accommodations include satellite TV and a fully equipped kitchen with dining area. All of the private bathrooms come with a hairdryer. Private parking is free of charge on the premises. An open market can be found 0.9 mi away. The water park Annagora is 2.2 mi from the property. 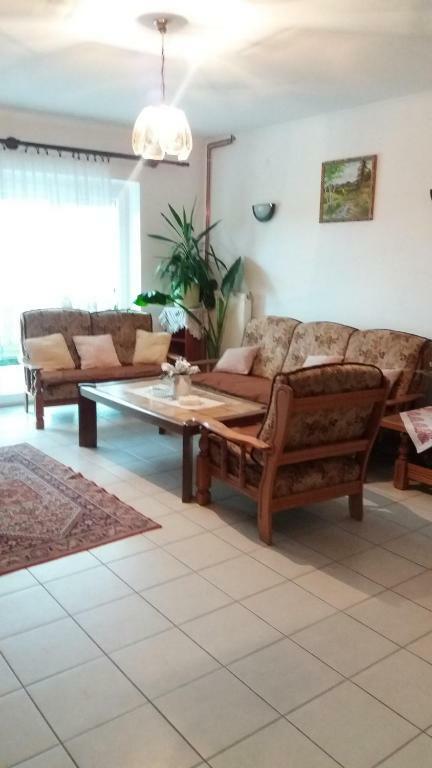 This property is also rated for the best value in Balatonfüred! Guests are getting more for their money when compared to other properties in this city. When would you like to stay at Landhaus Forrás? A szálláshely családi fészek. Szüleim jovoltábol van rá lehetöség , hogy ki tudjuk adni mivel mi nem élünk a környéken . Anyukám egész jol megérti a németet , de perfekt kézzel lábbal beszélö! :-) Sajnos mindig akad akinek nem elég , dehát mi apartmanokat adunk ki, és igy nem muszály szerintem , hogy 5 nyelven beszéljenek . En igy is örülök ,hogy még tudják ezt csinállni !! Ausztriában élek 29 éve és ezért van a külföldi Bank szám és az email cim . Nyugodt környezet pihenni vágyoknak . House Rules Landhaus Forrás takes special requests – add in the next step! Daily cleaning is available upon request for a surcharge of EUR 6. Please inform Landhaus Forrás of your expected arrival time in advance. You can use the Special Requests box when booking, or contact the property directly using the contact details in your confirmation. A bit cold apartment with good beds, but thin blankets. The Pool was not open until 1. May and we did not see this in the advertisement (only after we had booked). We could not pay with cards. A bit further to the coastline than expected, but good location if with car. Not a good shower (in the bath). Only one bathroom for 8 bed apartment. nice environment, nice garden, pleasant owners. 1.House is up on the hill,you have to use car to get to Balaton lake and the center,where is difficult to park 2.House is really old with old furniture inside and packed by owners staff 3.Owners aren't friendly and I felt that I bother them with my stay. We could have used air conditioning, since it can get quite warm during the summer.